High school will never change. Abigail (Quinn Shephard) returns to high school after a nervous breakdown and hopes to get everything back to normal. Of course, with this being high school, no one ever forgets about her and her crazy tactics, which is why, on the very first day, rumors are already swirling about her. One of the leaders in bringing up the rumors is Melissa (Nadia Alexander), a type of mean-girl who has some issues of her own, but uses her anger and rage to hide it all. But both of their lives change when a substitute teacher (Chris Messina) fills in for the semester and wakes both of them up. Abigail is awoken because she sees something of a tortured soul within him, whereas Melissa doesn’t like the attention that Abigail is getting and decides that it’s up to her to take matters into her own hands. Damn cheerleaders and their cliques! 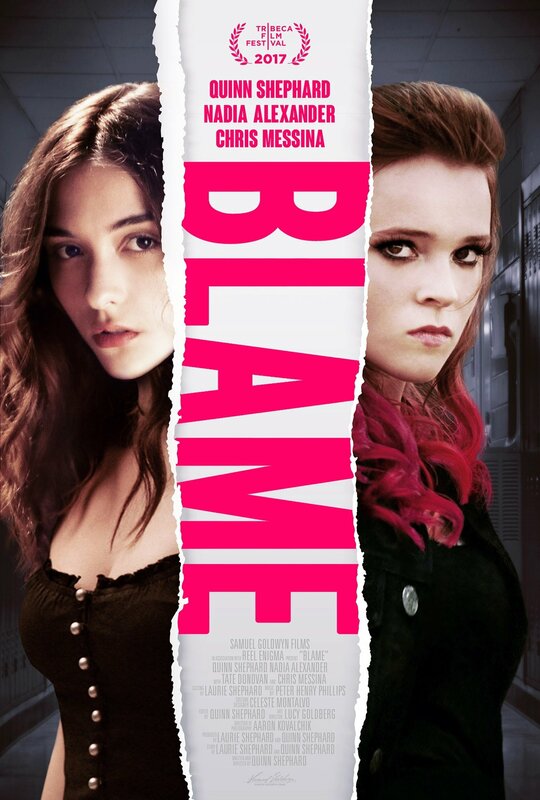 Blame, for all of its missteps and flaws, is still an impressive work because of its 22-year-old director/co-writer/editor/producer/star Quinn Shephard, who takes something that could have easily been a dumb, conventional after-school special, and turn into something raw, gritty, mean, and a little sad. It still feels like the work of someone incredibly young, who is just starting out and getting used to the game of making movies, but for the most part, it’s a solid debut and is a sure sign of things to come. That said, the movie’s got some problems, and it mostly comes through in its plot. Mostly, Shephard likes to have a little bit too much going on; there’s Abigail’s story, there’s Melissa’s story, there’s the subsitiute teacher’s story, there’s a few other girls stories, there’s the Crucible, and oh yeah, there’s the various romantic subplots that come up every once and awhile. While all are interesting in their own rights, mashed-up in a 100 minute movie, it just doesn’t totally work, with some parts feeling much better than others. Move on, girls. It gets better. That said, there’s a realism to this that I appreciated, mostly because Shephard seems to know and understand how rough and grueling high school can be, especially when you’re a little different. Some of it may have to do with the fact that she’s young enough to remember high school like it was literally yesterday, but there’s no nostalgia or sunshine here – it’s just mean teenagers, treating each and everyone of each other awfully. Shephard doesn’t shy away from this, nor does she ever seem to be trying to get across some tacky message about bullying and why it’s all wrong. Basically, she’s just showing us that high school is a pretty rough time and for some, she’s not wrong. What helps this all out, too, is that the ensemble is all pretty good. Shephard herself is an interesting and compelling presence on the screen, who can get away with a lot, without saying much of anything at all; Alexander is rough, raw, and a little unlikable, until you realize that there’s possibly more behind her evil and possibly cruel intentions; and Messina, while playing a bit of a loser-like character, gains sympathy by showing us that he’s just as sad, confused, and depressed as the students he’s teaching and doing his best to put up with. The whole love-angle feels like it could have been more fully fleshed-out, but believe it or not, Shephard and Messina have a nice chemistry to where you see the attraction and possibly, love, but you also don’t want to buy into it, either. So conflicting. Yet, so beautiful. High school, in a nut shell. Consensus: As a debut, Blame serves as a promising, if also messy high-school drama that digs in deep and doesn’t shy away from the rougher aspects of adolescence. Yes! But also, no! I don’t know! Ugh!